Expats and tourists from around the world are drawn to picturesque San Miguel de Allende for many reasons. Arguably Mexico’s prettiest colonial town, San Miguel’s narrow cobbled streets wind past colorful colonial houses and around corners to placid plazas where fountains play. The tall, ancient wooden doors of its colonial buildings open onto hallways that end in sunny patios, or onto rooms with high, beamed ceilings and worn tile floors. 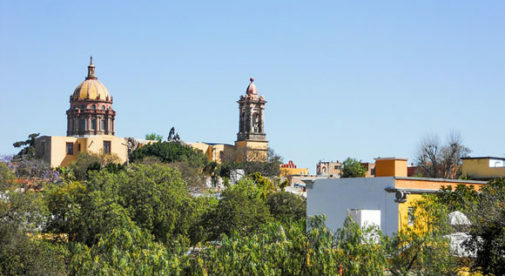 The historic center, el centro, has been beautifully renovated, with many of the colonial buildings converted into boutique hotels, restaurants, or shops. In the early 20th century foreign artists were charmed by San Miguel’s dreamy Baroque colonial architecture and blossoming art scene. Many of them settled here, starting artistic institutions and schools, laying the groundwork for the expat communities that thrive in the city to this day. Many expats have found San Miguel the perfect place to start their dream business. 16 years ago, Beverly Nelson wanted to open a holistic retreat in Mexico. Well-known San Miguel, with its good infrastructure and vibrant tourist economy, proved the perfect place. Today her wellness center and B&B is arguably the best-known alternative health and retreat center in Mexico. Thanks to San Miguel’s fame, she gets clients from around the world and the large expat population (as many as 10,000) ensures a local market. “I have consistently been in the black,” says Beverly. During her free time, she and friends enjoy going to concerts, films, gallery openings, the theater, or dinner at someone’s home or in a local restaurant. “There is so much to do here in San Miguel, there is never a lack of choice,” she says. Those in the mood for a splash-out gourmet meal or a night in luxury, won’t find San Miguel wanting. After all, this is the kind of town where you may spy a famous author or a Hollywood A-lister at the next table in your local restaurant. But don’t worry. As the town’s expats have discovered, you don’t have to spend mega-bucks here…because San Miguel has restaurants and real estate at every price point. Lunch at a casual local restaurant can cost $10 or so (and you can order in English). This means that you can enjoy San Miguel’s sophisticated vibe no matter what your budget.